Organic, gluten free, non-GMO, Kosher, and vegan. Made in USA in gluten-free facility. 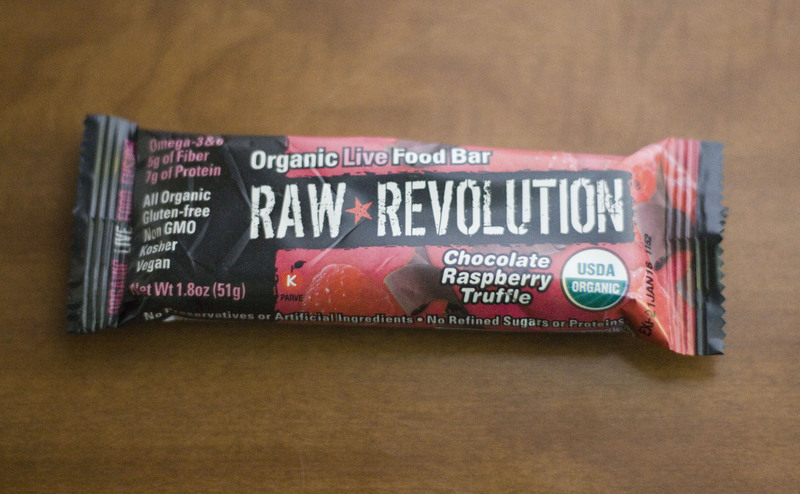 Delicious, it was like eating a candy bar made of nutrients. It definitely tasted like a chocolate raspberry truffle, the dessert type – not the mushroom. I tried to take my time to really savor the flavor but I ended up scarfing it pretty quickly, despite all best attempts. It didn’t have any of the chalky powdery feeling that many protein bars do, where it feels like you are chewing on gummy dirt that tastes like peanuts and chocolate. I would put this at the top of my list of protein bars I have tried, it’s better than the other organic ones I have eaten. That all being said, this is only the second of these reviews that I have done and my real decision on which organic protein bar is the best will have to wait until the last of these reviews. While the Chocolate Raspberry Truffle packs less protein into basically the same amount of space, it has a slightly better cost per gram on the protein content compared to the Daily Mocha Mantra I reviewed last time. While I love the coffee flavor of the Daily Mocha Mantra, I have to say, flavor-wise, the Chocolate Raspberry Truffle is a clear winner over anything I have tried by 22 Days so far. Since this bar is one of the few I have come across that is actually made in a gluten free facility this makes it ideal for people who have extreme allergies to gluten and need to be extra certain that something is entirely gluten free.